Purple Metal Polish is in a class of it's own. This is truly a no-rub metal polish. When you see just how easy it actually is to polish aluminum, you will be totally amazed. Specially formulated for EASABILITY, DURABILITY and a SUPER HIGH QUALITY SHINE. It is a SUPER QUICK and EASY maintenance product. 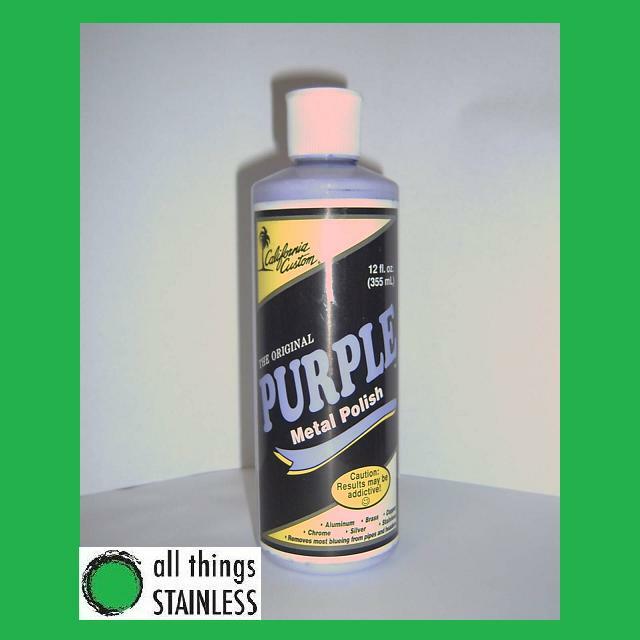 Purple Metal Polish contains a superior abrasive along with Hi-tech cleaners and sealers to SAFELY CLEAN, SHINE and PROTECT all metal surfaces WITHOUT SCRATCHING! This product can be applied on hot or cold metal. Also Excellent for removing light scratches on plexiglass, bug screens and plastic lens covers. When using this product on metal, DON'T use it like you would an average metal polish. This is completely different. See just how little rubbing it really does take to achieve a shine. Once applied, fold a clean terry cloth towel and (DON'T RUB!) buff off, wet or dry, to a brilliant CLOUD FREE SHINE!